In 2013, an Adobe report found that marketers felt marketing had changed more in the previous two years than in the past five decades. Today, over five years later, the pace of change has apparently accelerated even more. Take, for instance, the number of marketing technology (MarTech) solutions available today. As of last count, there are now 6,829 different MarTech products provided by 6,242 vendors spanning 55 categories. This represents a 27% increase from last year’s total, and there’s no sign that things will be slowing down any time soon. The explosive growth in the number and diversity of MarTech tools is a good indicator of how fast things are evolving in B2B marketing. That’s because many of these tools emerged from marketers’ shifting needs as they keep up with how their customers actually buy. But without even looking at the marketing world’s MarTech stockpile, every marketer knows we’re living through fast-changing times because of digital transformation. What’s less clear yet greatly more important is how this development impacts our strategies and results. 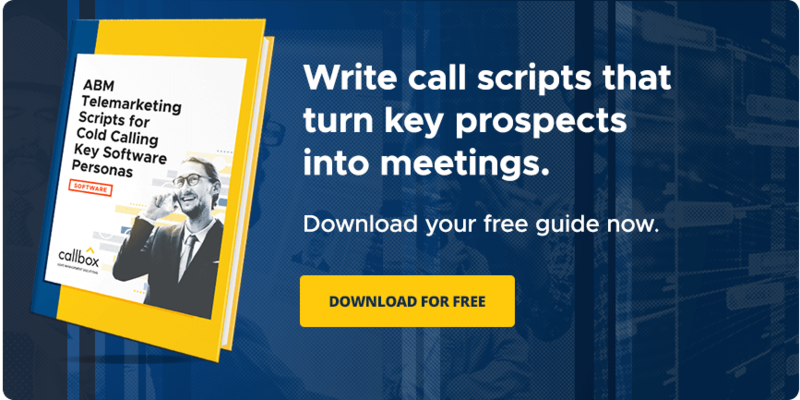 To help find out, the Callbox team recently published a free eBook that provides an in-depth analysis of how rapid digital transformation is reshaping marketing in nine (9) key B2B industries. In the eBook, we tackle cyber security vendors’ tendency to rely on FUD (fear, uncertainty, and doubt) as a messaging strategy and why this approach yields limited success with today’s more-informed software buyers. We then talk about some proven alternatives for vendors to follow instead. B2B FinTech continues its double-digit growth as payment platforms, lending solutions, and SaaS-enabled back office tools start seeing mainstream adoption. The challenge now for B2B FinTech firms is to find a sustainable strategy to influence decision-makers in a buyer-led, consensus-based purchase process. For more than half of the businesses surveyed in Interop ITX’s 2018 State of Infrastructure, the need for adequate storage is the biggest factor for their changing business IT systems. But buyers want more than just bigger storage space; they’re looking for a complete solution. Cloud solutions’ evolution from cost-saving measures to business-critical investments has created a more diverse ecosystem of buyers. In fact, there are now five broad types of cloud customers, each requiring a different marketing approach. Success in B2B cloud selling will depend on how vendors can identify and connect with these different buyer groups. Discover the current state of cloud computing and look at the changes at different angles, from overall trends all the way to industry-specific usage and adoption. An increasing number of potential advertising clients are moving campaigns in-house and are opting for project-based arrangements. This has led to a significant drop in new business revenue for creative agencies. As a result, agencies are now devising fresh ways to pitch and close new customers. Marketers in the healthcare space today face unique challenges as they interact with risk-averse buying committees that follow different budget cycles. To thrive in this challenging landscape, healthcare marketers need more innovative ways to engage potential buyers. With intense competition from new and established firms, unconventional ways that clients choose consulting services, and continued disruptions to consultancies’ core business, it’s a very “turbulent” climate for management consulting companies. Should management consulting companies be worried? Let’s take a look at how big players prepare ahead with a brief analysis of the industry. Marketers in manufacturing industries need to have deep familiarity with the way engineers and technical professionals research and evaluate potential purchases. Thanks to a number of recent industry reports, we now have a clearer picture of how technical buyers arrive at a purchase decision. Like marketers in other industries, telecom vendors also face multiple stakeholders throughout the sales process. Recent research sheds some light on the roles that each decision maker plays and how each stakeholder impacts buying decisions. To get an in-depth look at marketing trends in each of these industries, get your copy of the free eBook now. Judy Caroll is a marketing executive at Callbox. She is a blogger, online marketer and loves to share with you the best stuff in sales and marketing. Follow Judy on Twitter and Google+.